Folate Deficiency in a Father’s Diet Could Cause Negative Pregnancy Outcomes by Changing Sperm Epigenome | What is Epigenetics? Scientists at McGill University, Canada reported that folate deficiency in a father’s diet could increase birth defects in the offspring by altering sperm epigenome. These defects include craniofacial and musculoskeletal malformations. The scientists fed male mice either a folate-deficient or folate-sufficient diet throughout life and then performed genome-wide DNA methylation analysis and subsequent functional analysis to identify differential methylation in sperm of genes implicated in development, and chronic diseases such as cancer, diabetes, autism and schizophrenia. They found that >300 genes are differentially expressed in offspring placenta, but only two correspond to genes with differential methylation in sperm. Their results suggest that sperm histone H3 methylation or DNA methylation could be involved in epigenetic transmission and indicates that adequate dietary folate in the father is also essential for offspring health. 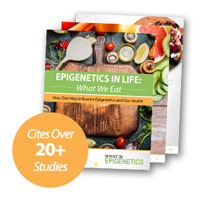 Get a free preview of our new e-book Epigenetics in Life: What We Eat, which explores different foods that may adjust epigenetic tags on DNA.